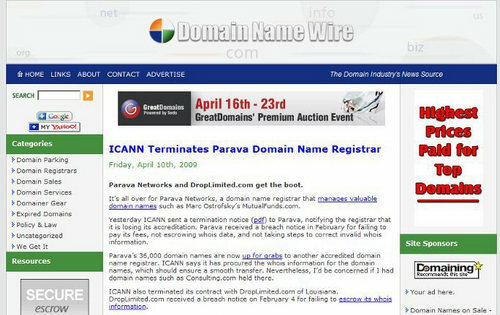 A look back at the domain name industry ten years ago this month. Domain Name Wire circa 2009. I’ve been writing Domain Name Wire for 14 years. Over 11,000 posts. The domain name industry has changed a lot over time. This morning I looked back at what was going on this month ten years ago in April 2009. Parking was important back then but revenue was falling. Remember when Parked acquired WhyPark? This will bring back memories of mini sites, too. Sedo picked up RevenueDirect a couple of months before. Frank Schilling’s Name Administration was trying to court direct advertisers for its domains. GeoDomains were also hot back then. Remember the GeoDomain Expo? Network Solutions settled a class action for frontrunning. The registrar was reserving domains when someone searched for them. It held them for four days so that customers could only register the domains at Network Solutions during this period. The company said it was doing this to block others from frontrunning. So it was frontrunning to stop frontrunning. It was a bad idea. A company called Live Current was selling some of its great domain names including Vietnam.com and Body.com for $400,000 each. Sedo launched SedoMLS, enabling registrars to offer aftermarket inventory on their sites. Afternic’s DLS launched a couple of years before that. We were harping for bigger “for sale” notices on parked domains. It took a while for this to happen. That was also the month Susan Boyle became an overnight sensation (see video below). When she went viral so did the website at SusanBoyle.com. But the singer didn’t own it. Learn from a career salesperson. Are you a good salesperson? It’s something I’ve always struggled with, but no matter what your job is, sales is part of it. That’s especially the case if you’re a domain investor! Today’s guest has a career in sales, selling books door to door while in college, then insurance, real estate and now domains. Brian Harbin of Grit Brokerage explains what he’s learned about sales. There are a lot of great takeaways that you can use in your business. Also: Domaining down under, Namecheap, stolen domains, Uniregistry and more. This week’s sponsor: Name.com. Use code DNW for $50 off.